The London Foodie: L'Atelier de Joel Robuchon - Michelin Starred French Cuisine Gone Japanese! L'Atelier de Joel Robuchon - Michelin Starred French Cuisine Gone Japanese! Cost: There are a number of menu options, including set menus of 2, 3 or 4 courses for £31, £36 and £41 respectively. There are 2 tasting menus, with options of 5 or 8 courses, priced at £95 or £129, with optional accompanying wine flights. There is also an a la carte menu, and an extensive menu of small tasting dishes, priced from £15 to £22. About: Joel Robuchon held three Michelin stars in Paris until his retirement in 1996. In 2003, he opened the first in a series of more informal restaurants called L'Atelier de Joel Robuchon, including in Paris, Hong Kong, Tokyo, Singapore and Las Vegas. The concept of these restaurants was that diners would sit at a bar, inspired by Japanese sushi counters, round an open kitchen, and meals would be served on a first-come, first-served basis. The London branch opened in 2006, a few doors down from The Ivy, is headed by chef Xavier Boyer and his team. On the ground floor is L'Atelier (one Michelin star), with its counter-serving concept. Here, modern French dishes are served in large or tapas-sized portions over the rosewood counter, with diners on red leather stools, sitting at what is in effect a giant chef's table. The setting is strikingly dark, with black, grey and red being the predominant colours, and little or no natural light. The first floor restaurant (La Cuisine de Joel Robuchon) has more traditional tables, but still has an open-plan kitchen and wood-fired oven, and a menu that changes with the seasons. On our visit, we had ring-side seats at the counter of L'Atelier. One of the nice things about the set up is that although we were alone for the first part of our evening, by the time it came to the main course and desserts, the counter seats were all occupied, and we spent the evening deep in conversation with diners either side of us. This is a very unusual experience in a Michelin starred restaurant in London, and made it feel more like a very top notch supperclub. What We Ate: The amuse bouche was a royal of sweetcorn, with popcorn, aged port reduction and parmesan foam - a lovely dish with a palate great combination of crunchy textures and umami flavours. We kicked off with a yellowtail carpaccio with orange zest, lemon dressing, sesame seeds and Espelette pepper – the Basque pepper and orange zest worked a treat (heady scent and flavours) here with the meaty yellowtail. Sea scallops cooked in the shell with lemongrass and seaweed butter (£18) came next – I very much enjoyed the flavour of nori seaweed in the butter, a great idea which I will try and replicate at home. This was followed by gyoza of veal shank with red miso which was rich and delicious, girolle mushrooms and a flavoursome harissa sauce, with coriander, parmesan foam (£21). We also ordered a lovely crab salad, served on a savoury sablet and topped with guacamole, cucumber mousse and fresh herbs (£19). This was also excellent, refreshing and light. The langoustine ravioli with Savoy cabbage and foie gras sauce (£26) was decadently delicious. Next came the pan-fried foie gras with fresh almonds (£18) - served with a confit of rhubarb, rhubarb puree, and mango coulis, the tartness of the rhubarb was a fitting contrast to the fatty liver, although the fruit coulis reminded me of the Nouvelle Cuisine style of the 1990s - a little too sweet for my palate. Better still were the veal sweetbreads cooked teppanyaki style (grilled on a hot plate), with Roman lettuce stuffed with deglazed onion, bacon and bayleaf emulsion (£22) – this was superb with sweetbreads being very soft and creamy. One of my favourite courses was Joel Robuchon’s beef and foie gras sliders with lighly caramelised bell peppers and served in a delicious brioche bun and with French fries (£21). The meat dishes were served with the signature Joel Robuchon mashed potatoes, a dish of legendary reputation, made with 50% butter, it was utterly sublime. Le Chocolat Tendance, with chocolate mousse, dark chocolate sorbet and Oreo cookie crumble – decadently chocolatey, this was a rich dessert with contrasting textures. La Sphere - Lemon bubble with lemon custard, yuzu marshmallow with lemon sugar and yoghurt ice cream – my favourite dessert, this was refreshing and with a great scent and flavour from the Japanese yuzu citrus fruit. La Cerise, Black Forest mousse, Tahitian vanilla whipped cream and chocolate liqueur biscuit – beautifully presented and the fanciest (and nicest) Black Forest Gateaux I have ever seen. What We Drank: We started the evening with a couple of glasses of the house Champagne, Veuve Cliquot NV (£17 each). The restaurant has a wide selection of wines and sparkling wines by the glass, from £8 to £24. In bottles, white wines start at £29 for a Picpoul de Pinet, and reds at £39 for a Recantina from the Veneto. Prices escalate steeply from there, and there is a special selection of French iconic wines going as far as the vertiginous £2,900 bottle of Chateau Petrus 1996. The selection is mostly from France, Italy and Spain, with some options from the New World, including unusually a Tannat from Uruguay, and a white Chateau Musar from Lebanon. We put ourselves in the hands of Sabrina, the sommelier on the evening of our visit. Wines were mostly served in Riedel glasses. 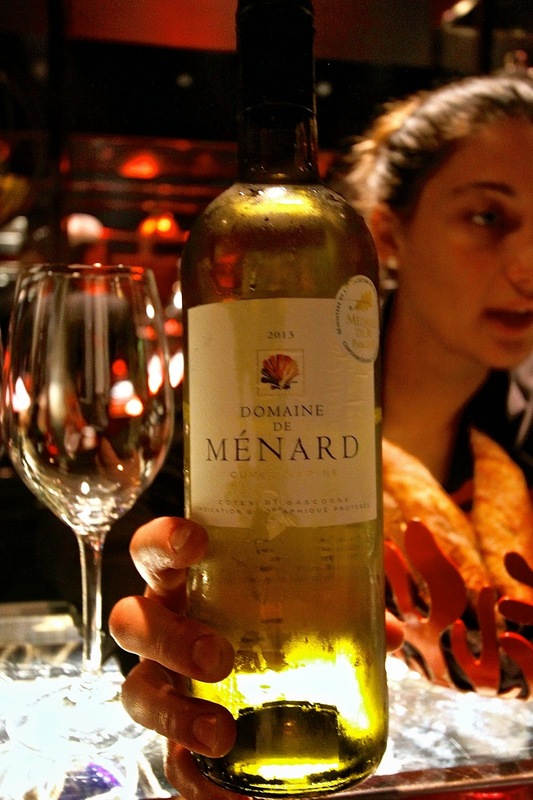 With the yellow carpaccio, we had a glass of Domain de Menard Cuvee Marine, from Cotes de Gascogne (£29 per bottle). Made from colombard, sauvignon blanc and the Cognac grapes uni blanc and gros mansang, this was an aromatic, elegantly crisp wine, with an intense nose of tropical fruit and grapefruit, refreshing acidity and good length. Off dry, it stood up wonderfully to the orange zest in the carpaccio. 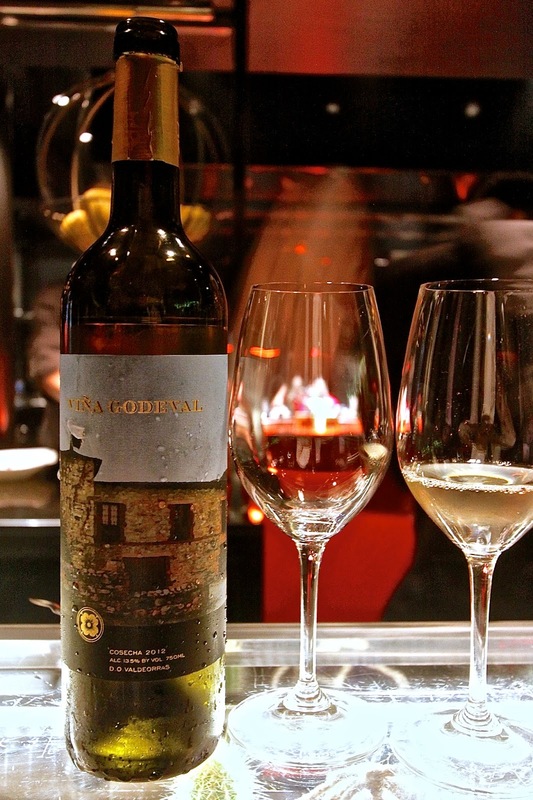 With the crab salad, we had a glass of Godello 2012, from Viña Godeval in Galicia (£44 per bottle). Made from one of my favourite grapes, albariño, this was well structured, with a good minerality and delicate lemon fruit. 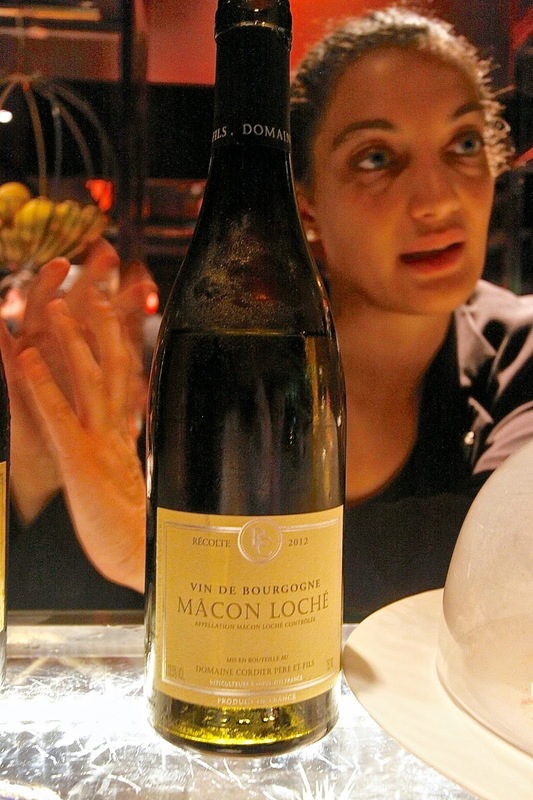 To accompany the scallop, we had a glass of Macon Loche 2012 from Domaine Corder (£59 per bottle), a classically elegant Chardonnay from the Maconais. 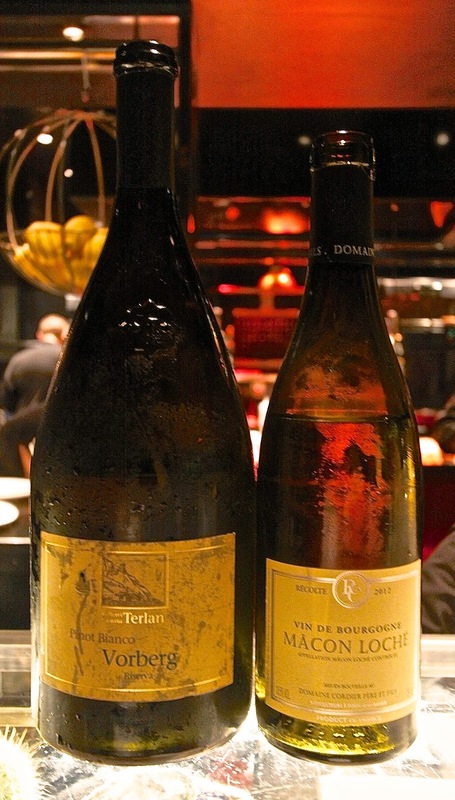 With the gyoza, we had a Vorberg Riserva Cantina Terlan 2010 (£16 per glass) from the South Tyrol, Italy. An elegant wine made from Pinot Bianco, this was rich, well structured and with sufficient stone fruit on the palate to stand up to the veal shank. To accompany the foie gras main course, we had a glass of Pacherenc du Vic-Bilh "Brumaire" 2009 (£64 per 50cl bottle). From the southwest of France, this was a wonderfully rich, sweet and satisfying wine, and a nod to the classic Sauternes/foie gras combination. With the langoustine ravioli, we had a glass of Les Grenouilleres Montlouis Demi-Sec 2009 (£68 per bottle) from Domaine La Grange Tiphaine in the Loire. Made from 100% Chinon Blanc, this was a lovely off-dry wine, with aromas of apple, dried and citrus fruits. Matching the sweetbreads, we had a glass of Cerasuolo di Vittoria Classico 2011 (£69 per bottle) from Sicily. Made from Nero d'Avola and Frappato grapes, this wine is aged in pot amphora buried underground. Light in colour, it had intense, richly savoury qualities of leather, tobacco as well as red berry fruit, and structured tannins. It was superb in its own right, and a great partner for the veal sweetbreads. With the burger, we had a Ribera del Duero: Resalte Crianza Tinto 2009 (£78 per bottle). Made at Bodegas Resalte de Penafiel, this was made from 100% Tempranillo matured in American oak. It was savoury, intense and delicious. Likes: The counter-top service allows diners to experience all the activity in the kitchen from close up. The food is excellent and I would be hard-pushed to fault it. There is a range of menus across a wide range of budgets, including some very good value pre- and post- theatre options. 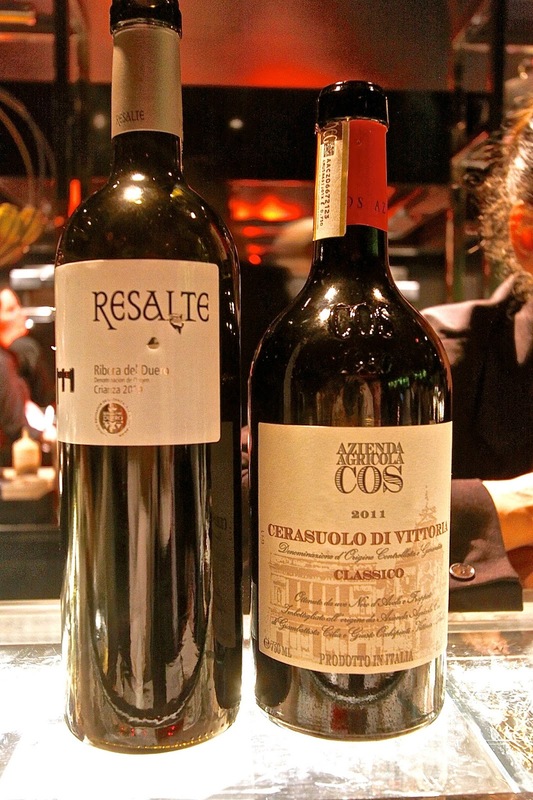 The wine list is thoughtfully constructed and innovative, with some really unusual wines mainly from Europe. Verdict: Stunning food, great service and a casual but elegant restaurant set-up, L’ Atelier de Joel Robuchon chef’s table is one of the most coveted in London, and deservedly so. I thoroughly enjoyed my dinner there and cannot wait to return. Highly recommended.